Stoneplates, the symbol of a true knight, grant the strength to face various hardships. The precious rare speckled stoneplate grants a small boost to defense against magic, flame, and lightning. 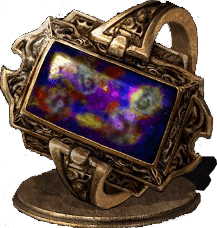 Speckled Stoneplate Ring is a Ring in Dark Souls and Dark Souls Remastered. Players can equip up to 2 Rings, but equipping two of the same item is not possible. Increases magic, fire, and lightning defenses by 25 points. Dropped or given by Siegmeyer of Catarina. This ring is a way to add on a little extra defense against damage sources that are harder to block. Because it caters to three different damage sources it is more reliable than the other stoneplate rings. The problem with this ring is that the 25 point boost against a given elemental attack is not worth the use of a ring slot. This is compounded by the fact that most areas focus on one elemental damage type, making the other stoneplate rings superior. Even in an ideal scenario, players are better off selecting armor that provides the elemental defenses they need, and using their ring slot on more useful rings. If a player is running a challenge build with armor that has universally terrible elemental defenses, it might be worth considering, but most players should avoid this ring.